They say that fashion runs in cycles and while some styles will become obsolete there are others that return to be reborn and restyled. None so true than with one of my favourite retro repeats of the moment... the velvet shirt. When I was in my early teens I remember having one such shirt. Being a Gen Y and born of the era of the "Going Out Top" my long sleeve deep maroon velvet shirt with press stud buttons was my favourite special occasion shirt, to be paired with a pair of black pants and kitten heels.... I know, super cool right? Needless to say when I saw this trend making a comeback I couldn't help but jump on board. 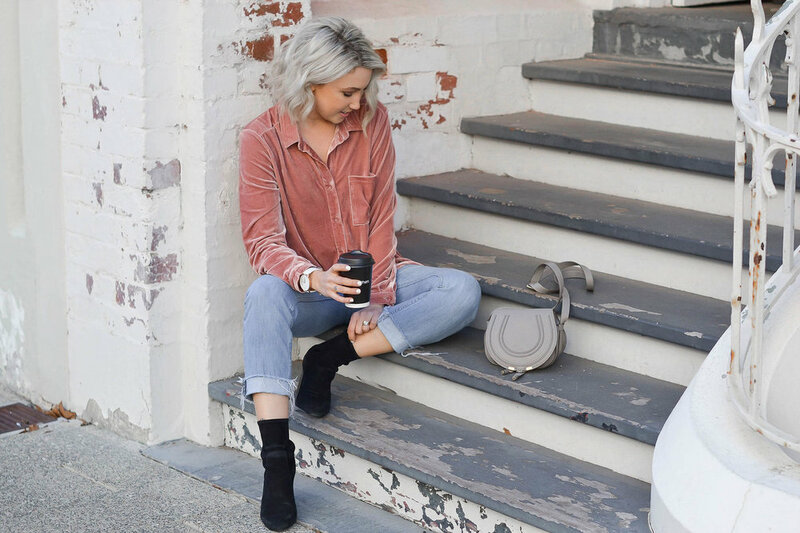 This time around I've ditched the black pants and kitten heels for classic denim and ankle boots and my take on styling this retro beauty has taken a more casual approach. That's not to say however that with the right skirt (I'm thinking leather pencil skirt) and heels the velvet shirt can't be elevated to "Going Out" status. However you style it, it's sure to get interest... at the very least a pat on the back to get a feel of that soft velvet fabric (insert wink emoji here lol).